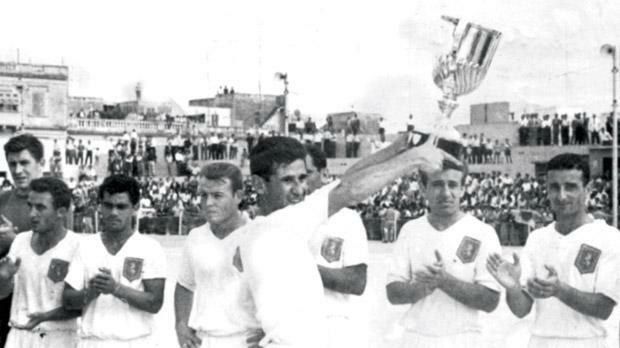 Josie Urpani holds aloft the Scicluna Cup after Valletta beat rivals Floriana in the 1960-61 final. In 1950, in an attempt to help clubs make some extra money, Meme Scicluna, owner of the Gżira Stadium, launched a new competition for First Division teams – the Scicluna Cup. The first edition featured two sections. Competition ‘A’ was contested between Sliema Wanderers, Floriana, Valletta and Ħamrun Spartans, and Competition ‘B’ involved Luqa St Andrews, St George’s, St Patrick and Hibernians. The senior competition was won by Sliema Wanderers who beat Ħamrun in the final. Section ‘B’ was won by Luqa. The following season, the competition was played along the same lines. Sliema retained the cup, this time beating Hibernians 4-2, in the semi-finals, and Valletta 3-1 in the final. In the following two seasons, the competition was not held but was re-introduced in 1953-54 with a different format. It was decided that the previous season’s champions and cup holders would meet in the final. In those days, football in Malta was dominated by Sliema and Floriana. It was, therefore, no surprise that these two clubs figured in seven of 14 Scicluna Cup contests. The first time the two clubs met was in season 1953-54 when Sliema won 1-0 with veteran Tony Nicholl getting the winner. Between 1953 and 1966, Floriana never managed to defeat Sliema in this competition, so much so that the Blues fans began to call the trophy the ‘Sliema Cup’. For their part, Floriana did their utmost to wrest the title from their rivals but to no avail. Whatever their position in the league, Sliema always rose to the occasion in this competition. Between 1949 and 1960, the Blues lifted the Scicluna Cup on nine consecutive occasions and to rub more salt into Floriana’s wounds, they beat their arch-rivals six times in a row. Floriana’s only crumb of comfort came in season 1958-59 when, after two drawn matches, the honour was shared for six months by each team. In 1959-60, Sliema did not qualify for the competition and consequently lost the right to defend it. That season, Valletta won the double and Floriana made it to the final as the FA Trophy finalists. Floriana saw this as their chance to win the elusive trophy for the first time but Valletta had a formidable team in those days and started the 1960-61 season on a top note by beating their eternal rivals in the final of the Scicluna Cup. Valletta’s defence, led by Joe Cilia, countered all Floriana’s efforts and their attack toyed with their opponents. Still, it had to be a lucky goal by Joe Zammit which gave them a 1-0 lead at half-time. Floriana started the second half like a house on fire but Lolly Borg and Tony Cauchi missed easy chances. Valletta hit back immediately and Charlie Chircop and ‘Wanis’ Borg increased their advantage to three goals. Ten minutes from time, Billy Dalli narrowed the deficit for Floriana but City held off Floriana’s desperate efforts to secure the honour. Floriana did win the Scicluna Cup in 1961-62 and 1962-63 when on both occasions they beat Hibs in the final but lost again to Valletta in 1964. The Scicluna Cup was last held in season 1965-66 at the Manoel Island ground when Sliema Wanderers once again beat Floriana 1-0. The competition was suspended when the management of the Gżira Stadium was transferred from the Scicluna family to the Testaferrata family. During its short, but eventful history, the competition was played 14 times. Sliema won the cup on ten occasions, thus ­creating a legend which still rings loud and clear around the Sliema clan. It is no wonder that old-timers still talk proudly of Sliema’s achievements in this competition. It was also fitting that the last final was won by the ­Wanderers.